?What is Prehabilitation? Could it help you? Do you suffer from common conditions such as neck/ back pain, shoulder, knee or hip pain? If so, this could this be a sign of a muscular imbalance often caused by our modern living or incorrectly structured training programmes. People usually seek treatment when they are injured or in pain, however prehabilitation is a form of physical or corrective exercise therapy that aims to reduce the likelihood of injuries occurring. If you are unlucky to have suffered injury corrective strategies can also be used to reduce recovery time and get you back to fitness. This is achieved by maintaining or restoring balance throughout the body’s muscular system. Imagine your body as a bike wheel, if all the spokes are tensioned properly then the wheel is balanced and works well. If one of the spokes becomes loose, you may not notice straight away, but as it loosens, more spokes are stressed and start to loosen and the wheel becomes unstable and doesn’t function well. The same happens when the muscles in your body become tight or weak as it creates imbalance in that area. You may not notice anything to begin with but after a while you might notice stiffness and/or pain around joints. There are many muscles that support the correct function of complex joints and the stiffness around these joints is caused when muscles are out of balance. 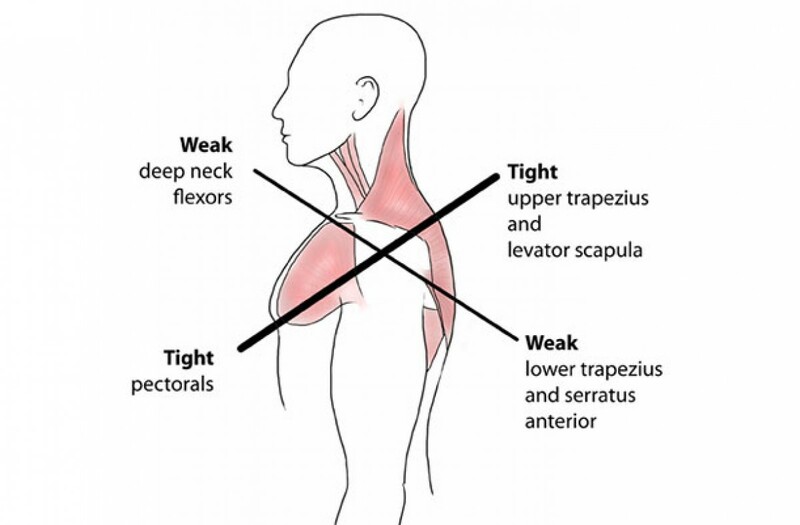 You can see examples of this happening throughout the body and one such example is the shoulder. The shoulder joint system is a very complex interacting series of joints and requires a lot of fine tuning to function properly. Our often poor postures - leaning over workstations, slumped in sofas, etc., disrupt this fine balance leading to painful - and sometimes difficult to treat - shoulder pain. 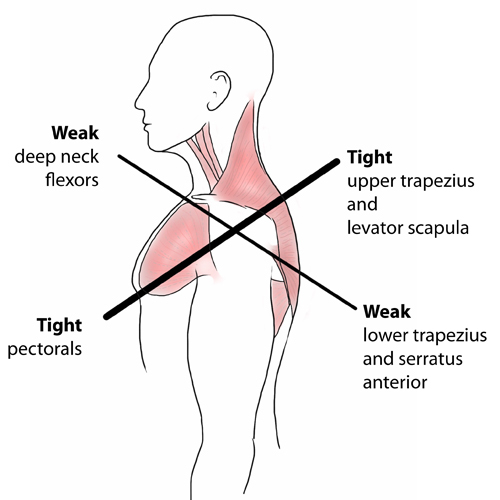 In the example below you can see how this common posture (referred to as upper cross syndrome), can affect your neck and shoulders. An initial consultation at MB Osteopathy consists of a thorough evaluation of muscle balance/function to inform the correct bespoke treatment plan for you. Do you suffer from common conditions such as neck/ back pain, shoulder, knee or hip pain? If so, this could this be a sign of a muscular imbalance often caused by our modern living or incorrectly structured training programmes. People usually seek treatment when they are injured or in pain, however prehabilitation is a form of physical or corrective exercise therapy that aims to reduce the likelihood of injuries occurring. If you are unlucky to have suffered injury corrective strategies can also be used to reduce recovery time and get you back to fitness. There are many potential causes of back pain. According to research 60%- 80% of the UK population suffer back pain at some point in their lives. In my opinion we can do a lot to help ourselves so we are not resigned to the fact that we’re going to suffer significant back pain. There can be many causes of back pain but often the most common is a mechanical pain. This means that the problem is in the mechanics of the back; the bones, muscles, ligaments, discs, joints, and nerves.